DigiLink :: Business Class Wireless Internet Los Angeles, Business Class Wireless Internet Marina del Rey, Culver City wireless, Playa del Rey wireless, Venice wireless internet, Century City wireless internet. DigiLink's new carrier grade, state-of-the-art Synchronous Wireless service can provide your business with symmetrical internet bandwidth from 1.5 Mbps to 300 Mbps. 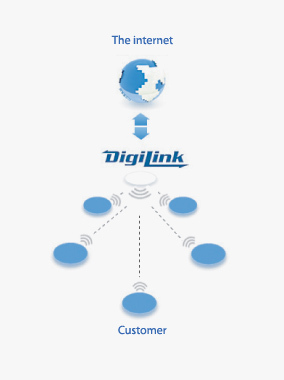 For the ultimate in business wireless connectivity, DigiLink offers Synchronous Wireless, providing businesses with carrier-grade tough, high performance, wireless service. Business Class Synchronous Wireless Connectivity. Synchronous Wireless is DigiLink's new carrier grade, state-of-the-art wireless service. DigiLink's Synchronous Wireless service can provide your business with symmetrical internet bandwidth from 1.5M to 1Gbps. Synchronous wireless is a GPS timed system that provides 100% CIR and QoS to support all applications and voice services. DigiLink's Synchronous Wireless meets or exceeds the reliability of standard T1 wired services that businesses can rely on. DigiLink's Synchronous Wireless is offered with a choice of payment plans, either one, two, or three year terms at exceptionally affordable price points that can support all your business processes. This service is ideal for community, SMBs and enterprise environments including corporate, entertainment, utility, healthcare, legal, real estate, education and more. Providing high-speed Wireless internet access to businesses in: Santa Monica, Culver City, Marina del Rey, Century City, Playa del Rey, West Los Angeles, and Venice. # Coverage area is up to 10 miles of our office building in Marina del Rey, CA and there must be line of sight between customer's premise and our office. # Business service is symmetrical bandwidth. Rates show download/upload bandwidth.